For a start I should probably explain that the name of Great Basin is rather misleading. By a basin most people understand a flat area surrounded by hills or mountains. In the case of the Great Basin it is a bit more complicated. For a start it is an absolutely huge region, not much smaller than the whole of Spain, but with a small population. The only real population centres are located on its edges. But more importantly it is not flat at all. In fact the Basin includes valleys, basins, lakes and mountain ranges of Basin and Range topography. 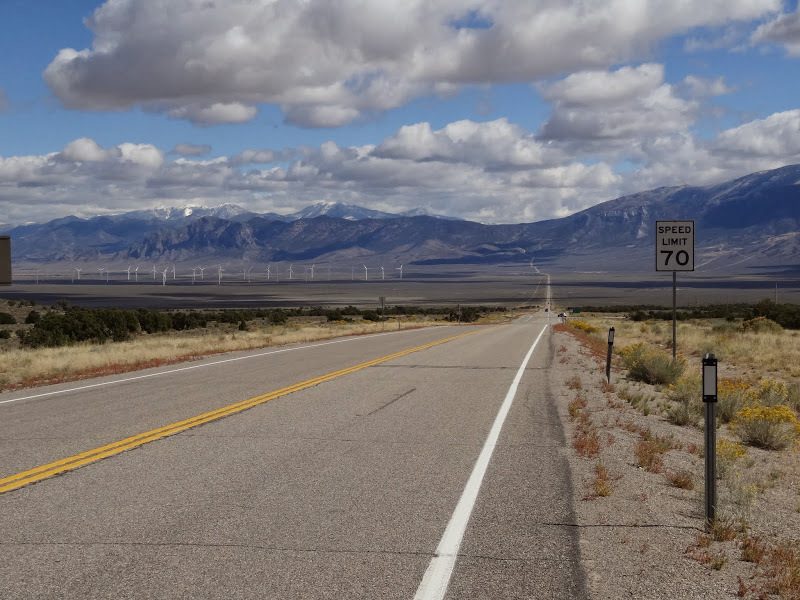 For example driving the US Hwy 50 in Nevada includes crossing at least half a dozen substantial mountain ranges and the road often climbs up to 7000-8000 feet. (2100-2500m) above the sea level. They run parallel to each other and are roughly oriented from north to south. That means that driving here is never boring. Yes, there are long straight stretches of open highways (perfect for testing the top speed of our rental Camaro) but there are also twisted mountain roads as well as great vistas from the higher elevations. All this with minimal traffic. In fact some of the lesser roads were virtually empty. 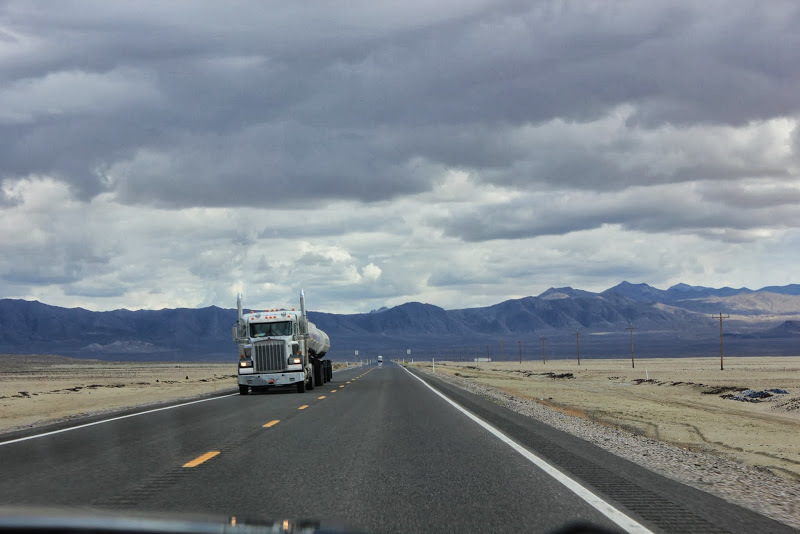 For example when we chose Nevada Hwy 722, which for 65 miles bypasses the main highway to the south, we only encountered 3 or 4 vehicles. If the landscape wasn’t wild enough then there was the weather. We were crossing the Basin at the same time as a cold front from the North Pacific stretched this way. That meant spectacular cloud formations, dark mysterious skies and snow. Yes we did experienced snowfall along with some freezing temperatures, especially crossing the mountain passes. 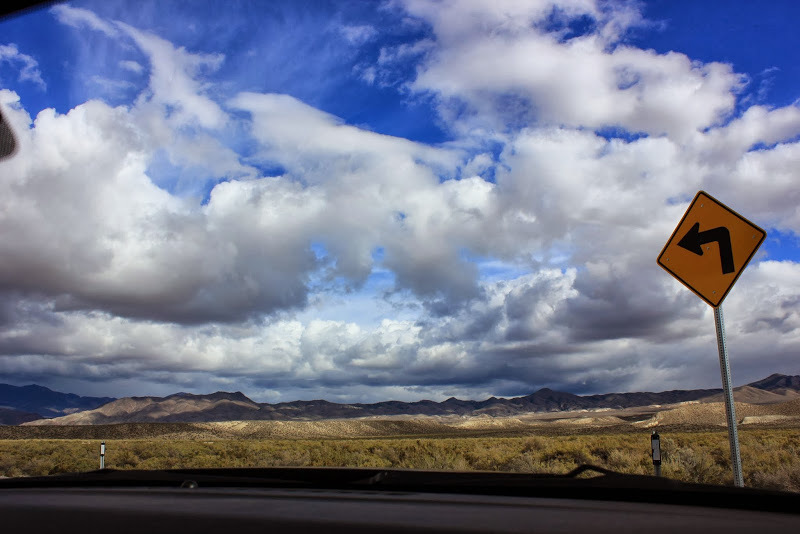 It took us the good part of the day to cross most of the Basin from Fallon in the west to the town of Ely, close to the Utah border in the east, where we decided to spend the night. On one hand we were mostly speeding but on the other hand we made plenty of photo stops. Probably too many judging from the number of pictures of the empty highways I now have on my laptop but it was damn difficult to stop taking pictures as the landscape kept changing every few minutes and the spectacular sky even more often. In Ely we stayed in an old-school, family run motel and had a great breakfast in a local diner. It was probably one of the least touristy locations on our 3300miles road trip and I absolutely loved it. Sure there was a casino, located in what was once the tallest building in Nevada, but the whole town had picturesquely desolate feel (still not as desolate as some of the communities we passed like Austin or Eureka) and even the casino had a very provincial feel. It is all a far cry from the glitz of Vegas. One thing not to miss in this fascinating little town is Nevada Northern Rail Museum located in East Ely Yards. It is definitely one of the best rail oriented museums I have ever visited. It displays steam engines (some still operational, used for excursion trains) diesel engines and even an electric one. 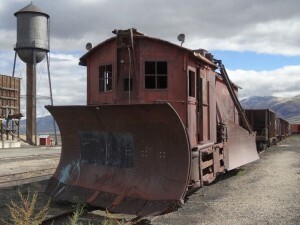 It also has a steam operated crane, one of the few left in the world and the oldest in America. We could have stayed in the museum for most of the day but it was time to move on as we wanted to finally do some walking. 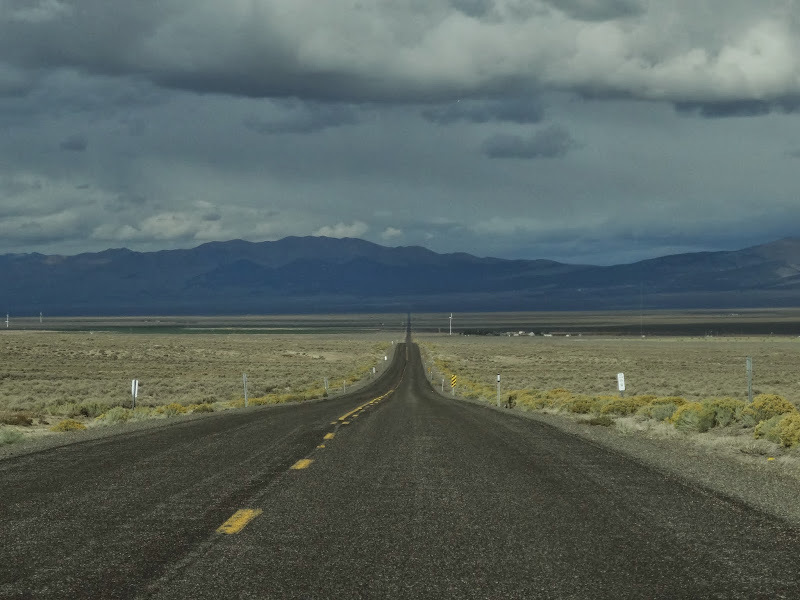 For that we chose the Great Basin National Park located about 60 miles SW of Ely near the tiny town of Baker. It is one of the least visited parks in the National Parks System and it was clearly visible. When, after a spectacular scenic drive from the gate, we finally reached the parking lot at our trail head, there were only three other cars (which were gone by the time we finished our walk). We started our hike at the elevation of about 10000 feet (just above 3000m) and at this elevation there was still snow on the trail (that could be reason why so few people were there that day). Luckily it was only a few inches and the weather was actually very nice with a perfect blue sky, decent temperature and no wind. We chose the Bristlecone-Glacier Trail which let us see the oldest living trees on the planet, the bristlecone pines. Some of them are well over 3000 years old and still growing but if you expect Sequoia sized giants you will be disappointed. 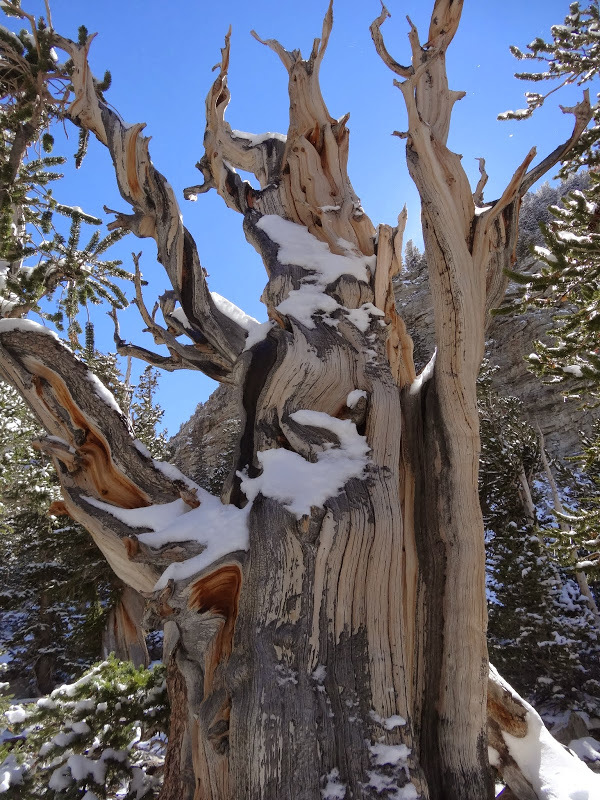 These trees live so long because they grow incredibly slowly in their harsh environment. They are just few meters tall and look half dead but they are still amazing organisms. Their wood is so dense that it is resistant to insects, fungi or other pests. In fact it is so dense that it practically doesn’t rot, even after tree dies. 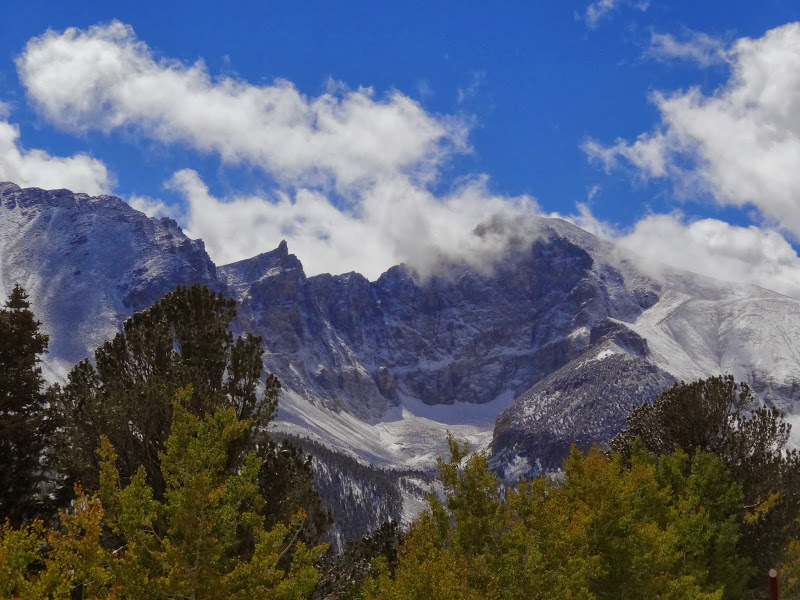 The interpretive trail loops around the grove of these amazing trees but instead of heading straight back to the parking lot we decided to push along the Glacier Trail to see the Wheeler Peak Glacier. It is the only glacier in Nevada as well as one of the southernmost glaciers in the US and one of the closest to the desert. After Bristlecone Grove we quickly climbed above the tree line and entered the cirque under the mighty Wheeler Peak. From there the glacier (a rock glacier to be specific) was clearly visible in the distance. We could push all the way to it (probably no more than a mile) but at that point we decided that time might be an issue and we didn’t want to get stuck if the weather changed. So after reaching an elevation of about 11000 feet (3350m) we turned back. In total we hiked probably about 8km in glorious weather and with spectacular vistas all around. It was one of the best hikes I have done for quite a while. 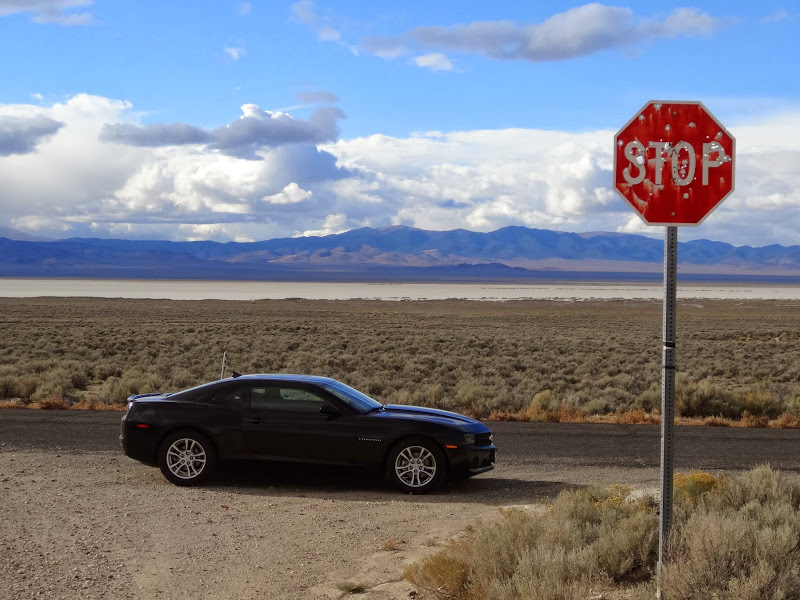 From the fascinating Great Basin NP we headed towards southern Utah as the Grand Canyon was our next destination. But there was still quite a lot of basin driving in front of us. By now the sky was clear (unlike the previous day) the sun was low and landscape looked more spectacular with every minute. I was really hoping that this day would never end. But finally the sun set and we arrived to the town of Parowan where we effectively ended our wanderings around this absolutely fascinating region. Of course there were many more sites ahead of us but that is subject for another story. This entry was posted in Uncategorized and tagged Bristlecone Pine, Ely, Eureka, Great Basin, Great Basin National Park, Nevada, Nevada Hwy 722, Nevada Northern Rail Museum, US Hwy 50, Wheeler Peak on December 27, 2013 by admin. New Hampshire and Vermont in a day. An unexpected trip to Amish Country. Sea and sand under the Florida sun.